Brimfield, MA (July 13, 2018) – A driver is in critical condition following an accident in Brimfield on Thursday. Police report that the crash occurred on East Hill Road Thursday afternoon. Officers and rescue workers responded to the accident scene where they discovered a Dodge sports car had traveled off the road slammed into a tree. Brimfield police and fire along with police and fire officials from nearby Warren all worked at the accident site to free the trapped Dodge driver, who has been identified only as a female. The driver suffered critical, life-threatening injuries. The patient was airlifted to UMass Memorial Hospital. There is no additional word available on her condition at this time. Police are still investigating the accident and have not yet determined a cause. Each case of a single vehicle accident is different and depending on the facts there could be several potential responsible parties. In some cases, the vehicle manufacturer may be liable if your accident was a direct result of a defect in the vehicle. In other cases, single-vehicle accidents may be direct results of poor road design or maintenance. Some examples of this poor road surfaces, including potholes, a malfunctioning traffic light or an intersection with a preventable blind spot, such as one that has been overgrown by trees and bushes. Finally, other drivers on the road may have contributed to the single-vehicle accident. For instance, you may have been swerving to avoid colliding with a car that made an improper or unsafe turn or lane change in front of your vehicle and ended up hitting a tree instead. Single-vehicle accidents can lead to severe and catastrophic, even deadly injuries that can be extremely costly to the victim and their family. If liability is established, the damage recovery is available to include lost wages, pain and suffering, out of pocket medical expenses and damages related to death, including funeral and burial expenses, in fatal single vehicle crashes. 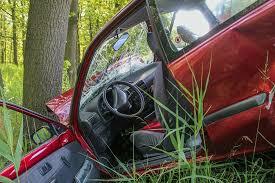 Liability in a single-vehicle accident case can be complicated. If you or a loved one has been seriously injured in a single-car accident, you need to consult with an experienced personal injury lawyer. With years of experience, we at the Law Offices of Jeffrey S. Glassman understand how to investigate these accidents, and we can provide you with an honest assessment of your claim and your chances of recovery. We are committed to helping our clients understand their rights and getting them the compensation they rightfully deserve. For a free consultation regarding your accident, call us at 617-367-2900 today.